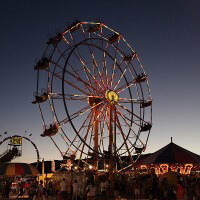 If you’re in the mood for some old-fashioned county fair fun, then you need to pack the kids in the car and head out to the 90th annual Cherokee County Fair. County fairs are a reminder of simpler times and a slower pace of life. They began as a way to highlight agriculture and livestock within a community. Soon contests, games of chance, pageants, entertainment and thrilling rides were added to the mix. All across the country during the harvest months of fall, counties and states host their annual fairs. The Cherokee County Fair offers many opportunities for anyone wanting to add a blue ribbon to their trophy cabinet. Competitions include: cooking, canning, sewing, arts and crafts, and photography to name a few. There’s even a dog show complete with costumes. Of course there are the traditional carnival rides, along with live music and the annual Miss Cherokee Rose pageant that takes place at 1 p.m. on Saturday on the main stage. It’s sure to be a good time for all! And don’t forget, nothing says fall like fair food: hot dogs, funnels cakes, cotton candy! Make sure you leave the diet at home and wear your stretchy pants; this kind of eating is not for the faint of heart. The fair runs Tuesday, Sept. 20 to Sunday, Sept. 25 and is sponsored by The American Legion, Thomas M. Brady Post 45, Inc. For more details, check out the Cherokee County Fair brochure.